People have been getting very excited about videos from the International Space Station (ISS) apparently broadcast "live" on Facebook - but they are not what they appear to be. The pictures are certainly stunning - astronauts in space suits apparently working outside the ISS against the background of the blue orb of the Earth. Huge numbers have watched and commented on the feeds. Some 17m people viewed the "live" on Unilad's Facebook page and another 26m people watched four hours of footage on Viral USA's page. They appear to be old material from between one and three years ago. The eagle-eyed may have noticed that there was no mention of any such Facebook live on the social media accounts of Nasa or the ISS, which would seem unusual. 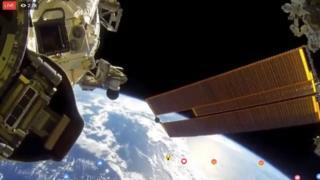 Nasa has confirmed to the BBC that this is not live video from the International Space Station and said it must be old spacewalk video footage. Is that Tom Hanks or Bill Murray? Where have these videos come from? It appears that at least part of the the video broadcast on Viral USA was filmed by astronaut Terry Virts during a spacewalk in February 2015. While the footage on the Unilad Facebook page appears to come from a spacewalk by Russian cosmonauts in 2013. However Nasa told the BBC that the space agency still gets very "excited" any time people get interested in space. And it is clear that people are getting excited about these views from space, judging by the huge numbers watching and commenting online. Although, not everyone has been fooled by what these images purport to show. Nasa suggests that anyone who wants to see video from space should have a look at their official Facebook or Twitter page, or that of the ISS. You may also be interested to know that there is a real live video feed from then International Space Station that you can view here. Four different high definition cameras have been placed on the outside of the space station, allowing the viewer to dip into a view of the Earth. This is to allow scientists to assess how well these cameras can operate in the extreme environment of space. Unilad told us that they decided to post an old stream from the ISS as a chance to "test the capabilities of what the 'live broadcast' feature on Facebook could really do". We also contacted Viral USA but have not received a reply at the time of writing.